Don't attempt to fight your way into an Irish pub today. Instead, make your own pub food at home with these eight recipes. Today is the day when everyone drops everything and runs to the nearest Irish pub to down pints of Guinness. The smart revelers will also order some shepherd’s pie or Welsh rarebit in order to pad their drinking. But the even-smarter St. Patty's day partiers won’t even try to elbow their way into a pub. Instead, they’ll bring home a few bottles of Guinness (it’s not as good as draught, but it does the trick) and enjoy them with these eight recipes. 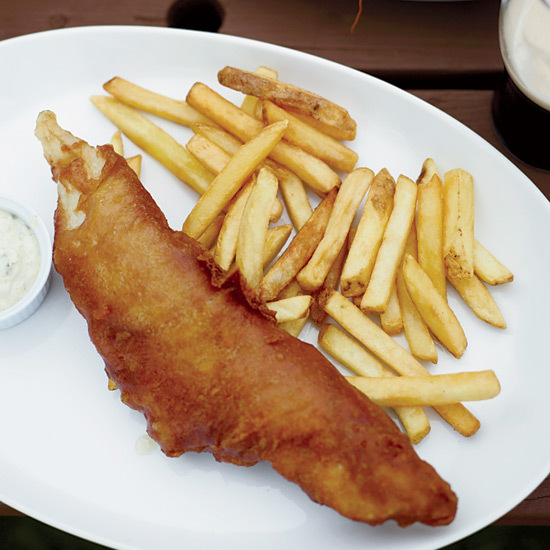 This version of a pub staple is fried in a wonderfully light beer batter and served with dilled tartar sauce. Beef stew is everything you want in comfort food—it’s hearty and satisfying—but what makes this version stand out is its subtle, sophisticated use of coriander and fenugreek seeds. Savory and meaty, these mini pies are quick and impressive. These messy, cheesy sandwiches are a fast and satisfying way to have breakfast for dinner. Traditionally made with mashed vegetables left over from a Sunday roast, bubble and squeak allegedly gets its name from the sound the ingredients make in the skillet. Madeira, a fortified wine, gives this dish a caramelly sweetness. These open-faced sandwiches (also known as rarebit) are hard to resist. Thick slices of toasted country bread get topped with melted extra-sharp cheddar cheese that’s spiced with Worcestershire sauce and Guinness. This dense and hearty soda bread is perfect for sandwiches, especially ones filled with smoked salmon. Related: Best Bar Food in the U.S.